Safariland 6360 ALS Level III Plus UBL Duty Holster FREE SHIPPING! The ALS® system is the next evolution in retention holsters and builds upon the successful SELF LOCKING SYSTEM (SLS). With many patents to its credit, the key to the Safariland 6360 system is an internal locking device that secures the weapon in all directions simply upon re-holstering, providing Level III Retention® which can also be elevated to Level IV Retention® with the addition of the Sentry installed. Although the holster is of fine quality (good retention, ease of draw), I found the molded plastic bracket (the part that connects the holster to the belt) uncomfortable during a long traffic detail. The curved edge bit into my hip. I solved the problem by swapping out the bracket with one from an old Blackhawk holster. (note: the screw holes needed modification). A flat surface against the hip would be more comfortable. Also, the Blackhawk belt loop system is much better. I emailed Safariland with the same comment. 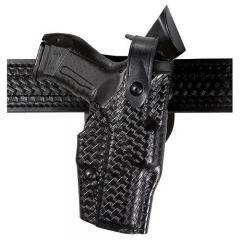 Great holster for a great price. Great holster, easy to use. So far I havent had any problems with the light getting stuck as im drawing my gun. Amazing holster for working patrol. it takes a little bit of practice to get used to it but is well worth it. the only way someone would know how to get a weapon out of this holster is if they have owned one. It holds my G17 perfectly and the extra protection is never a bad thing. My glock 21sf with my Light fits great. The 6360 ALS Level 3 Plus is an excellent duty holster and by far the most secure holster I've used in my 38 years and counting career. That being said, It does take extensive practice to become proficient drawing from it. The draw requires first unlocking & flipping forward the hood, then deactivating the internal lock and holding it in place to draw the weapon, and the weapon needs to be raised high enough for the muzzle to clear the shield over the thumb locks (this shield is easily removed). Because this requires first using the strong hand thumb to unlock the hood, then re-positioning the thumb to hold the lock forward while drawing, it takes a fair piece of time & coordination to draw & get that first shot off compared to a Level 1 or 2 holster. Every officer needs to decide how much speed heshe will trade for security, but if security is your priority, this is the holster for you. BTW, the 6360 made for a Sig P250 Compact 40 fits the Sig P320 Compact 40 perfectly, and the P320 Compact 45 fits snug but fine in it as well. Ordered for my XD Mod 2 4" service model with TLR1 light attached. Fits perfect. Very nice holster, just ensure you take the time to train properly before carrying on duty. Excellent retention. Great product with the level of protection needed. Very good holster and easy to use. This is the perfect retention holster--and I've tried a few. "Accept no substitute". Top of the line Holster. Fits My Ed Brown 1911 very well. Best retention holster for WMLs. Is the "plain" finish on this item Plain STX or Plain Leather? If it is STX, is Plain Leather available and what would the price be? I would want the mid-ride version for a Sig Sauer P320 full size with a SureFire X300U light attached. Thanks. This is a standard plain finish, and the STX plain is under a different SKU number, if you want to see them side by side just type "6360" in the search bar on our page. both the TLR-1 and TRL-1 HL are the same size so it should fit all the same. ©2002-2019 CopsPlus.com: Safariland 6360 ALS Level III Plus UBL Duty Holster FREE SHIPPING!